Corrosives are materials that can attack and chemically destroy exposed body tissues. Corrosives can also damage or even destroy metal. They begin to cause damage as soon as they touch the skin, eyes, respiratory tract, digestive tract, or the metal. They might be hazardous in other ways too, depending on the particular corrosive material. Most corrosives are either acids or bases. Common acids include hydrochloric acid, sulfuric acid, nitric acid, chromium acid, acetic acid and hydrofluoric acid. Common bases are ammonium hydroxide, potassium hydroxide (caustic potash) and sodium hydroxide (caustic soda). Other chemicals can be corrosive too. 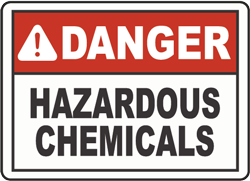 Check the supplier labels on chemical product containers. It is wise to treat unknown materials as very hazardous until they are positively identified. corrosives hazardous to my health? Corrosives can burn and destroy body tissues on contact. The stronger, or more concentrated, the corrosive material is and the longer it touches the body, the worse the injuries will be. Some corrosives are toxic and can cause other health problems. Check the MSDS and label on the container for warnings of other possible health effects. Some corrosives are also flammable or combustible and can easily catch fire and burn or explode. Some corrosives are incompatible with other chemicals. They may undergo dangerous chemical reactions and give off toxic or explosive products if they contact each other. The MSDSs and the labels on the containers should explain all of the hazards for the corrosive materials that you work with. Corrosive materials can severely irritate, or in come cases, burn the eyes. This could result in scars or permanent blindness. The stronger, or more concentrated, the corrosive material is and the longer it touches the eyes, the worse the injury will be. Corrosives touching the skin can severely irritate or even badly burn and blister the skin. Severe corrosive burns over a large part of the body can cause death. Breathing in corrosive vapours or particles irritates and burns the inner lining of the nose, throat, windpipe and lungs. In serious cases, this results in pulmonary edema, a buildup of fluid in the lungs that can be fatal. Many corrosives attack and corrode metals. Contact with corrosives can damage containers, equipment, installations and building components made from unsuitable materials. The rate of metal corrosion is greater when the corrosive is stronger and the temperature is higher. When acids attack metals, hydrogen gas is often given off. This is a flammable gas which can burn or explode if an ignition source is present. Common bases, such as sodium hydroxide and potassium hydroxide, can also attack some metals like aluminum, zinc, galvanized metal, and tin to produce hydrogen gas. The MSDS for a particular corrosive should explain which metals or other materials, such as plastics or wood, it will attack. Store corrosives in dry, cool areas, out of direct sunlight and away from steam pipes, boilers or other sources of heat. If a sealed full drum or carboy of a corrosive liquid is stored in direct sunlight or near other heat sources, vapor levels in the container can build up. This leads to an increase in pressure in the container. In severe cases, this could cause the container to rupture. A buildup of pressure might also result in the material shooting out into the face of the person opening the container. Good housekeeping, personal cleanliness and maintain equipment?